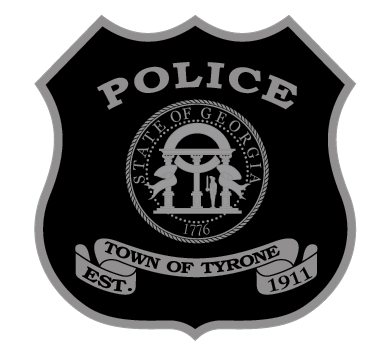 ​The Tyrone Police Department is a team of 18 professional men and women who are fully committed to providing outstanding public safety services to our citizens and making our Town one of the best places to live, work, and play within the State of Georgia. The effectiveness of the TPD in maintaining a low crime rate and, therefore, a high quality of life for our citizens has resulted in numerous designations as one of the safest cities in Georgia over the past several years. One publication even named Tyrone the #1 Happiest City in Georgia in 2014 thanks, in part, to our low crime rate. Our officers have worked hard to deliver these results for our citizens and business owners and we are determined to provide you with similar results year after year! We maintain an active social media presence on Facebook, Twitter, and Instagram in an effort to keep you informed about matters related to public safety in Tyrone. If you haven't already done so, please follow us! We want to provide you with the best public safety services possible and we believe receiving constructive feedback from those we serve plays a vital role in making that happen. Consequently, we invite you to take a few moments to complete our Feedback Form. It won't take long, but it will definitely help us out!